This topic contains 7 replies, has 7 voices, and was last updated by kimm2222 5 years ago. 100 or more hours: DOD flask or stainless steel DOD cup. 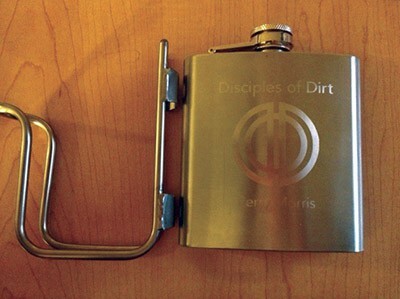 Check out the pic of Perry's flask and see how cool this thing is. The stainless cup will use the same graphics if you're not a hip flask kind of guy or gal. Most Hours Total: The Golden Hoe Award. Besides the prestige and admiration of your peers for being top trailwork dog, you will also be presented with a fine handmade in the USA trail tool from our sponsor Rogue Hoe. These rewards are for volunteer trailwork hours logged during the 2013/2014 fiscal year and are only available to current DOD/IMBA members who joined before October 2014. All hours must be reported to [email protected] before October 2014. The areas covered by DOD's trailwork rewards program are: Whypass, Eugene Trails, Springfield Trails, North Shore, Middle Fork Ranger District, Umpqua Cottage Grove Ranger District, and McKenzie River Ranger District. You can only earn one of the above rewards … which will be determined by the total number of hours you log by the end of the fiscal year. Every time you report trail work hours or attend a trail work party we will send you an update of your total hours for fiscal year 2014. Awards will be handed out at the DOD Holiday Party in December. If you have any questions or want to know how many hours you have accrued please contact us at [email protected]. Thank you for being the radest members … making DOD the best mountain bike club with a trail work addiction! Who will win the "Golden Hoe" this year? The 2 year streak is over for Team PANDA since they are now ineligible for the award. Do you want to see a list of the top three trail work hours DOD members? We can update it on a monthly basis so you know where you stand. How 'bout top five workers hours. Gives the other two mugs off the podium something to shoot for. We would like to congratulate the following individuals for already reaching a trailwork rewards milestone. Keep up the good work! We hope to see many more names on this list when its time to hand out rewards. Only current DOD/IMBA members are eligible for rewards. You can become a member for as little as $30.00 by clicking the link on our Join page. If you think you are a DOD/IMBA member who has performed at least 20 hours of trailwork for the 2013/2014 season and do not see your name below you may want to check and see if your membership has lapsed. If you are interested in seeing your name on this list, or moving up to the next level, please consider joining us at one of the following upcoming trailwork events http://www.disciplesofdirt.org/calendar. Man, almost makes me wish I had renewed my IMBA membership and reported all of my hours! Just imagine all the chocolate milk I could have fit in that flask. So wait, will we have to renew/join IMBA to receive a NW forest pass for this year as well? I could care less about the pint glass, but I do like getting my free forest pass. That being said, I do not plan on renewing my IMBA membership this year unless they get the insurance policy figured out. That being said, I believe I may have reached 20 hours before my membership expired. Does that count? No, you do not need to be a member of anything to earn a Northwest Forest Pass. You do however need to perform 16 hours of volunteer work in the USFS Middle Fork Ranger District (http://disciplesofdirt.org/forum/trailworkers-it-pays-give-back) during the 2013/2014 fiscal year. Hours worked at Whypass or on Northshore do not count towards the trail pass. Regarding your DOD/IMBA membership, as long as you are a current member at the end of the trailwork season you will qualify for one of the DOD awards. Your hours will still count even if you didn't join up until part way through the season or your membership lapsed for a while.